Learn about what the Chamber is doing to help businesses succeed! Welcome to the Newport County Chamber! The Newport County Chamber of Commerce is one of Rhode Island's largest business advocacy organizations formed to enhance the business, civic and economic vitality of Newport County and greater Rhode Island. We are an independent, non-profit organization with over 1,100 member companies employing more than 50,000 workers throughout Newport County and greater Rhode Island. Our purpose is to leverage the region's core assets to find solutions in the areas that matter most to the business and community, quality jobs, quality growth and quality of life. The Newport County Chamber has a wide variety of programs, publications, events, and business resources that directly improve the bottom line of members. 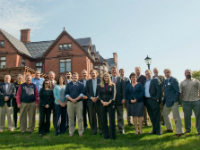 Connect Greater Newport is a new division of the Chamber focused on regional economic development. The goal is to support existing businesses realize growth and expansion opportunities while helping new businesses call the Greater Newport area home. Learn more here. We’ve transformed a historic school building in the heart of Newport, R.I. into a hub for the region’s growing innovation economy. Our newly renovated 33,000-square foot Class A coworking, private office, and meeting space is designed to spark innovation and build community. Visit InnovateNewport.org for more! The Newport County Chamber of Commerce helps its members succeed through legislative advocacy, economic development, education seminars, exclusive member discounts & savings, networking events and increased visibility.